I did a practice run making gravy this weekend. With a few minor tweaks, Nikki thinks that team Jew has a pretty good shot at winning. If I do win, it will be because of the meatballs. My meatballs rock the house y’all. Just to whet your appetite, here is a pic of said meatballs used “Andy-style” in a wedge (hero, sub, hoagie, grinder, sammich, sangwich, etc) with fresh mozzarella and arrugula. More details to come on game day…wish me luck! P.S. If you are lucky (or unlucky) enough to know me and my address personally — you are cordially invited to join our studio audience and help judge the throwdown winner at halftime. Oh yeah, and the game will be on too. I am so excited to find what you are going to put into that meatball. 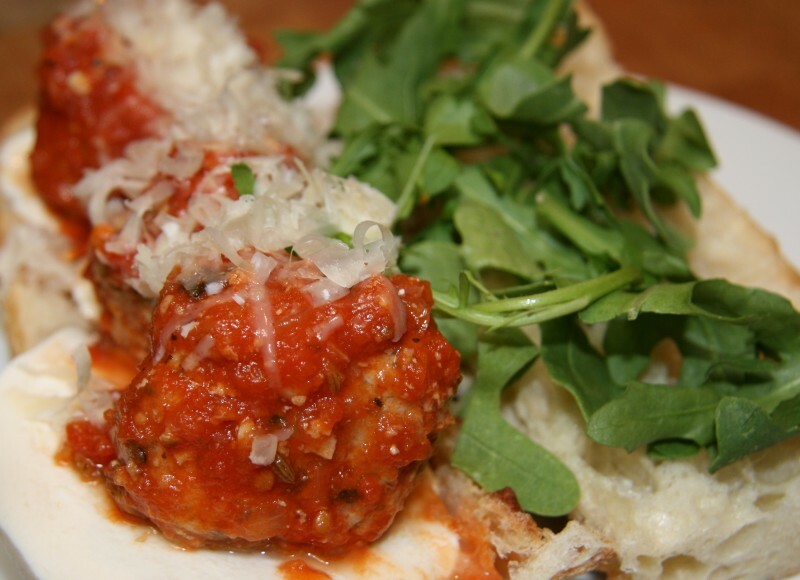 I just did meatballs last week in class – the basic version…. and turkey due to such a variety of students and religions. But the ultimate meatball is now on my short list… so I am waiting with baited breath – because this meatball looks like it COULD be it! We had one in San Fran last August that my husband almost melted into… so, I must find the recipe!